The latest edition of the Peoplehood Papers, volume 13, is a stimulating collection of short essays by a diverse group of thinkers and educators. 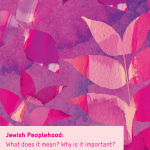 Each writer answered the questions: What does Peoplehood mean? Why is it important? and How do we nurture it? The results are a fascinating collection of accessible pieces that together add to the broader conversation about Jewish Peoplehood. This edition of the Peoplehood Papers also contains ideas for how to use the essays in educational settings. Take a look at it here, and please share your thoughts and responses with us. If you are motivated to write your own essay after reading some of these, please send it to us – we’d love to see it! PreviousPrevious post:Resources for the Educator – Movie: AddesNextNext post:Launching the new CJPE website!